Crystalline silica is a organic matter found in nature. Materials such as sand, stone, and concrete all contain silica. Thus, workers who use those materials to make products such as bricks, glass and pottery, may be at risk of inhaling the respirable particles during sanding, drilling, sawing and other acts of labor. To ensure working conditions do not pose a risk of serious harm, OSHA has begun to enforce provisions of it’s 2017 standard protecting workers exposed to respirable crystalline silica. The International Agency for Research on Cancer has said silica exposure could increase the chance of developing lung cancer but a recently published study in the American Journal of Epidemiology helps to back up the agency’s claims. While silica has been labeled as a carcinogen in humans, this is one of the few studies that has quantifiable data that confirms it. The article studied about 34,000 workers who previously did not have exposure to substances that were cancer-causing. After a follow-up of almost 35 years, an estimated 546 of these workers died from lung cancer. Workers in the group that did encounter crystalline silica between the ages of 20 to 65 years at an exposure level of 0.1 micrograms per cubic meter of air had an excess lifetime risk of 0.51 percent. With silica having a major impact on worker health, employers should establish engineering controls, such as dust collectors. Industries often employ air filtration systems to lower the presence of harmful particulate matter. Air filtration is a valuable first defense against the health effects of airborne contaminants. In a separate study published in CA: A Cancer Journal for Clinicians, the authors highlight that regulations that lower occupational exposure to silica can cut the amount of deaths from silicosis and lung cancer by about one-half compared to the current rules according to risk assessment data, Science Daily reported. 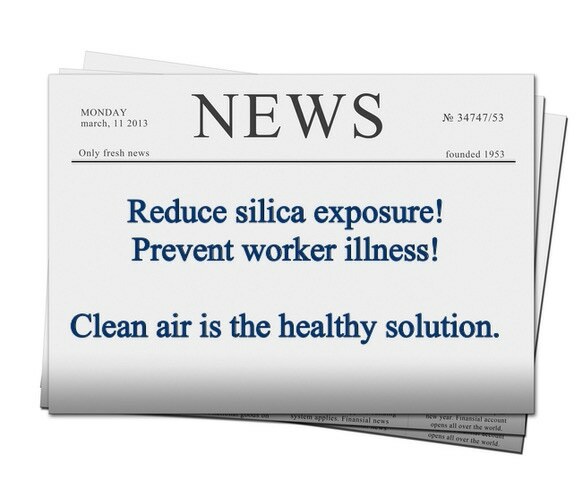 Authors Kyle Steenland, of Emory University, and Elizabeth Ward, of the American Cancer Society, also show that employers could implement various control measures to reduce silica exposure.